This vegan dish is rad as a standalone meal or perfect as a side dish to spiced meat, fish or crispy tofu. This is a great warming dish to enjoy in winter. If you can make it ahead and give all the wonderful flavours a chance to develop and blend together. Everything tastes better the next day, right?! Heat oil in a large saucepan over medium-high heat. Add the curry powder and stir for 1-2 minute or until aromatic. Add onion and garlic and cook, stirring for 3-4 minutes or until onion has softened. 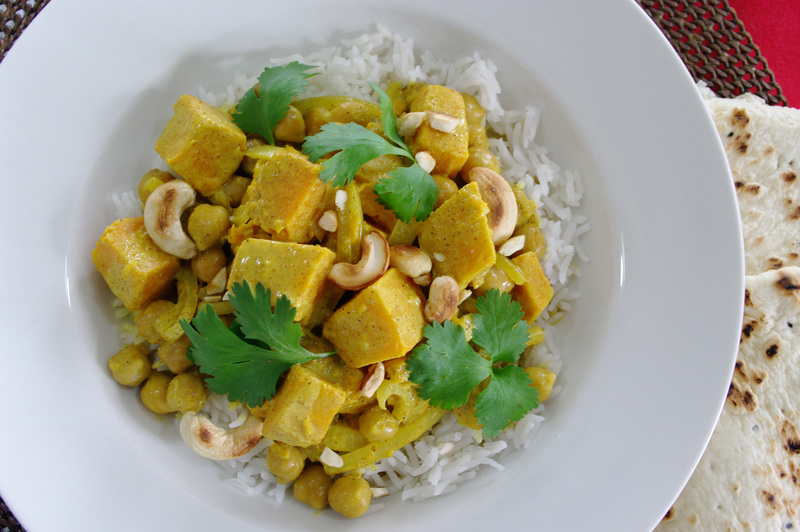 Stir in the coconut milk and bring to the boil, reduce heat to simmer, stir in McCain Cubed Pumpkin and chickpeas and cook, uncovered for 5-10 minutes or until the coconut milk has reduced. Season with salt and pepper, to taste. Divide among bowls, top with coriander leaves and toasted cashew nuts. Serve with basmati rice and/or naan bread.